The Ghanaian Minister for Foreign Affairs and Regional Integration, Ms Shirley Ayorkor-Botchwey, says Nigerian traders are not affected by the recent notice to foreigners to quit the country’s retail markets. Foreigners engaged in retail business in Ghana were on July 11 issued a notice to quit the country’s markets. Ghanaian law reserves operation of retail business only for citizens. “Yes there is a problem that Nigerians and other ECOWAS citizens have been caught up in this issue of traders being given quit notice to exit our markets with their retail trade which is, by the law of Ghana, reserved for Ghanaians. “Even at the governmental level, we are dealing with it and the president himself is handling the matter to ensure that it does not escalate,” she said. 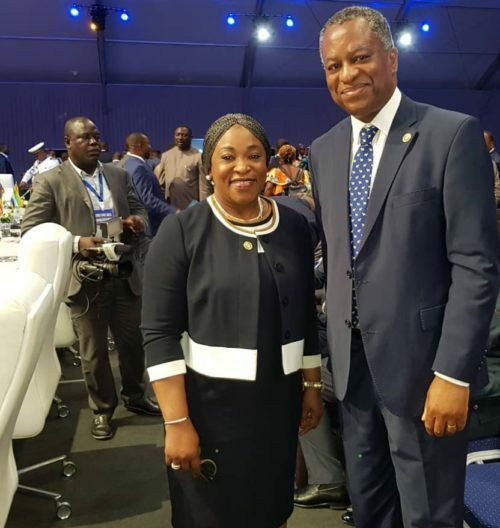 Onyeama said the Ghanaian minister’s visit demonstrated the country’s concern that Nigeria should, in no way, interpret the issue as xenophobia against Nigerian traders. “The minister’s visit was to assure the government and the people of Nigeria that the government of Ghana is on top of the situation and would resolve the issue,” he said. Onyeama said that the Minister explained that what prompted the outcry was not about nationals of ECOWAS, but nationals from outside Africa who had been installing themselves in the Ghanaian retail business. “And that that was actually their main focus of attack. But that the Ghanaian Retail Association, is now making a general outcry against all non-Ghanaian retail traders. “The government of Ghana is not happy about that because they want to be in strict compliance with all their obligations under the ECOWAS Protocol of Free Movement of Persons, Goods and Services,” Onyeama said of his meeting with the Ghanaian Foreign Minister. He said the Ghanaian Government was engaged in really coming out with a law that was consistent with their position as an ECOWAS member state. According to him, so, they are at that process, but they are also very mindful of the special relationship they have with Nigeria. “And are particularly keen that in no way should it result in any targeting of Nigerians, any xenophobia against Nigerians. “So, the government, in fact, the president himself, is personally engaged in addressing the situation,” he said. “For her to travel, to fly here to meet with me for one hour, I think, demonstrated the concern of the Ghanaian Government that Nigeria should in no way interpret this as some kind of xenophobia against Nigerians.